In Isle of Dogs, the newest film from twee auteur Wes Anderson, a cutesy cartoon version of Japan controlled by the evil mayor Kobayashi (Kunichi Nomura) banishes all dogs to a "trash island" after an outbreak of dog flu. The unfortunate truth is that the anti-canine government has purposefully infected the dogs to keep them out of Japan, and Spots (Liev Schreiber), the dog of the Mayor's nephew and ward Atari Kobayashi (Koyu Rankin) is the first to be banished. Trash Island is not a cute Japanese island like fox island, deer island or rabbit island — it's a terrifying place made from mountains of garbage, patrolled by soldiers and remote-controlled killer robot dogs. Still, Atari sets off to rescue Spots, now aided by five dogs — Rex (Edward Norton), Duke (Jeff Goldblum), King (Bob Balaban), Boss (Bill Murray), and the rough-around-the-edges Chief (Bryan Cranston), a street dog who becomes the reluctant leader of the pack. 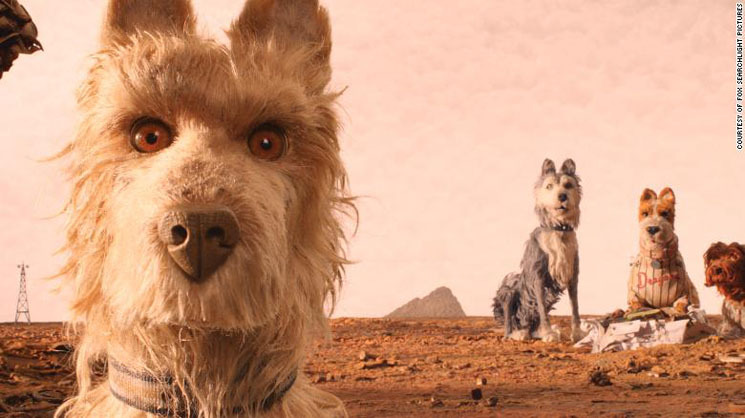 Isle of Dogs is more or less Anderson's second straight-up children's movie, and this is where his charm really stands out. The excellent supporting cast includes Greta Gerwig, Scarlett Johansson, Frances McDormand, Harvey Keitel, Tilda Swinton and Yoko Ono (playing a scientist named… Yoko Ono). The film is painstakingly animated in stop-motion in such a meticulous style that every errant fiddle of a character's hair, or each frame-jumping thread from their garment, feels purposefully and endearingly in its place. It's hard to find much fault with a film like Isle of Dogs, so in tune with what it sets out to accomplish. Anderson's famous attention to detail is present, and the story has a dreamy fable-like quality to it. Does it show an extremely simplified Japan? Yes. Even as a cartoon setting in a children's movie, it feels needlessly "Tintin In the Congo" about the cartoon Japanese people living in this imaginary world. Several people have reported falling asleep during the film, and I even felt myself drifting off a bit. Feeling comfortable basking in the warm nostalgia of the '80s and '90s movies I grew up loving, I'd like to imagine. Isle of Dogs has all the hallmarks of another Wes Anderson classic. It's beautifully shot, it tells a small but perfectly formed story, and uses some of Hollywood's best actors to portray a cast of plainly odd and unfussed characters. The dogs look fantastic and genuinely furry, and the waxy semi-translucent human characters look like action figures come to life. The soundtrack is excellent, featuring a well placed "I Won't Hurt You" by the West Coast Pop Art Experimental Band and a score by Alexandre Desplat (The Shape Of Water). It's a film worthy of the kids who will love it, rewatch it and buy the 20 year anniversary box sets in 2038.